Sriharikota: India’s maiden satellite mission to decode monsoon and climate changes was launched on Wednesday when its polar rocket successfully put an Indo-French satellite into orbit that also proved its reliability for the 19th time in a row. Blasting off in clear weather from the Satish Dhawan Space Centre here, ISRO’s workhorse Polar Satellite Launch Vehicle (PSLV-C18) also placed three nano satellites in a circular orbit, in the span of four minutes after injecting the 1,000-kg tropical weather satellite Megha-Tropiques at around 11.21 am. ISRO chairman K. Radhakrishnan along with Project Director Kunhikrishnan (L), satellite Centre Director Dr. TK Alex ( R) at a press conference on the successful launch of the PSLV C-18 in Sriharikota, Andhra Pradesh. Photo by PTI . The nano satellites are VesselSat-1 from Luxembourg, SRMSat from SRM University, Chennai and Jugnu from IIT, Kanpur. In his remarks after the precision launch by the PSLV on its 19th successful flight in a row, Radhakrishnan described it as “excellent" and the mission a “grand success". Information relayed by Megha-Tropiques is expected to benefit not only India, but also all countries in the Indian Ocean region and other parts of the world. “PSLV-C18 is a grand success. 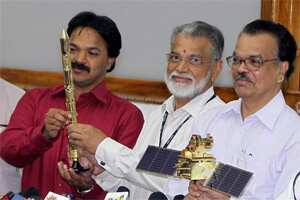 Very precisely, four satellites were injected into space in a circular orbit," Radhakrishnan said. The launch was delayed by a minute at the end of the 50-hour countdown with the ISRO chief explaining that it was to ensure that the rocket did not hit space debris, a common feature in low orbit in which the four satellites were placed. “We do some analysis and on that basis the launch was shifted," he said. Observing that there were many countries who will venture into the study of climatic conditions soon, Radhakrishnan said “Megha-Tropiques will be one of the early satellites on the constellation". The ISRO built-Megha-Tropiques carries three payloads-- two by French space agency CNES (Centre National d’Etudes Spatiales) and one jointly by ISRO and CNES--and a complementary scientific instrument.